Sometimes my daughter Syd’s drawers smell a bit gamey, like her soccer uniform after a match of living up to her title as “the finisher”. She’s a darling girl, don’t get me wrong. But she has a frightful habit of tossing items into her drawers to avoid that exhausting chore of putting them in the hamper. Enter drawer sachets. They give off that happy floral odor that can even compete with dirty socks. Here are a few nicely packed bundles gathered from from the natural garden. 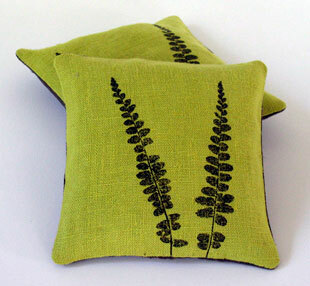 Show at top, and pretty enough to give as a hostess gift, this lime green natural linen drawer pillow was crafted by graphic designer Lotta Hellberg using safe dyes and aromatic potpourri. $22 for a set of two at Eco Artware. Lavender is always a draw. Just ask the bees. 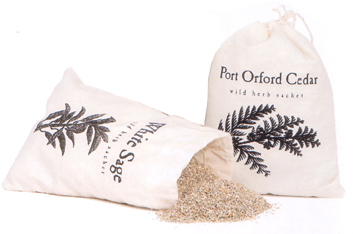 These Sonoma Lavender sachets from Body and Home are $18 and are wonderful for lingerie drawers. 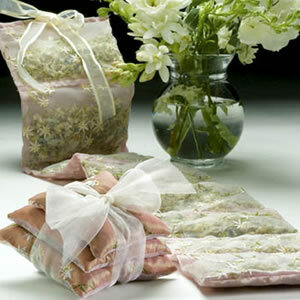 These Eco Seashell bags from Little Things Favors are not just for the bridal party. They’re Florida Coast fresh and add a delicate scent to the closet. $350 each. And for bringing in the great outdoors (and deterring the moths at the same time) the Natural Wild Herbal sachets at Eco Day Spa are $7.99 and tres outdoorsy.